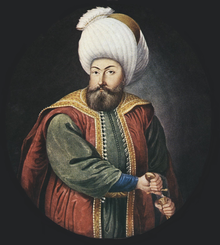 Osman I, Osman Gazi Khan or Othman I El-Gazi (1280  – 1324) Ottoman Turkish, Persian: عثمان بن أرطغرل, Turkis: Osman Gazi or Osman Bey or I.Osman), nicknamed "Kara" for his courage, wis the leader o the Ottoman Turks, an the foonder o the dynasty that established an ruled the Ottoman Empire. The Empire, named efter him, woud prevail as a warld empire  for over six centuries. Osman annoonced the independence o his awn sma kinrick frae the Seljuk Turks in 1299. The wastward drive o the Mongol invasions haed pushed scores o Muslims toward Osman's Anatolian principality, a pouer base that Osman wis quick tae consolidate. As the eastren branch o the Ancient Roman Empire declined, the Ottoman Empire rose tae take its place. Wikimedia Commons haes media relatit tae Osman I. This page wis last eeditit on 5 August 2015, at 15:09.